This is a simple, delicious way to cook fish. In this dish, red snapper is used. 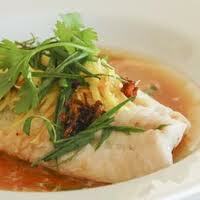 You can use other kinds of fish, such as salmon or halibut. This is a common way to cook fish in Guangdong province in China, in areas such as Toisan or Hoiping. Put fish in a dish. Add all ingredients, except green onions. Put dish in pan of boiling water, cover and steam for 20 to 30 minutes. Add green onions in last 5 minutes. Check fish to make sure it's not overcooked. Enjoy!